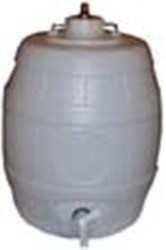 A basic 5 gallon barrel with a Pin Valve Gas Injection cap. The Hambleton Bard S30 type gas cylinder will work with the pin type pressure valves but it can be a little scary (and wasteful) as the pin causes the release valve on the S30 cylinder to open before the cylinder is fully screwed onto the pin valve casing. When this happens, you WILL lose quite a lot of gas and MAY get freezer burn as the valve and cylinder become very cold, very quickly.